Two Ojibwa boys, Rabbit and Bear Paws, from the Northeast are prone to adventures as opposed to working on their chores for the tribe. Older, but smaller, Rabbit is hyperactive and ornery. He easily tires of chores and chooses exploration and experimentation instead. 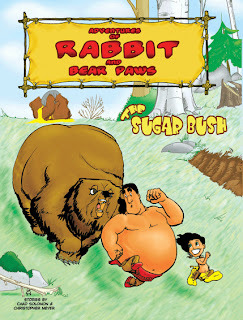 Rabbit easily leads his larger but younger brother, Bear Paws, astray and the two find themselves getting into all kinds of trouble. Colonies are popping up, trade is occurring, and trouble is brewing, leaving all kinds of new discoveries for the duo. Many times writings about Native Americans are based on stereotypes of all native cultures. In the case of the ADVENTURES OF RABBIT AND BEAR PAWS we have a book created by Chad Solomon, a member of the Ojibwa nation. Solomon and Meyer do a good job of incorporating Ojibwa traditions and beliefs into the story line. Both the elders and the animals impart knowledge through the deep-rooted oral traditions of real Ojibwa story telling, which makes the book personal and inviting. The depiction of adults as inferior or ignorant is common in children’s literature. Young people enjoy seeing adults as the antagonist. The dichotomy is stated, but in this case it is not between young and old, but between native peoples and foreign cultures. The Native American viewpoint is strong here as the British soldiers are depicted as simplistic, bumbling fools. The Ojibwa, on the other hand, are the peaceful, reverent and thoughtful culture, caring for all things created. That is, except the boys. They, especially Rabbit, are mischievous. It is a great perspective and one that is sometimes lost on the typical American of today. Other aspects of culture revolve around the medicine. Many native cultures believed in the ability of humans, or some humans, to transform into animals. The same is true with the Ojibwa, and this ability is a literary device that is used to save the boys from their own adventures and eventually teach them about their wrong doings. Despite all the good in the book, the plot and characters need some work. The mistake that many writers of children’s literature make involves underestimating the audience. Solomon and Meyer fall into that trap. Rather than allowing the interesting and powerful oral stories to stand on their own, the characters will then tell the reader what he or she was supposed to learn from the story. When I was getting my bachelor’s degree in writing, one of my professors offered the lesson with simple words: “Show me; don’t tell me.” The writers need to allow their stories and young characters to show the reader, rather than relying on some dialogue to insult the reader and tell them what they should have learned. Children do not have lengthy philosophical discussions about life lessons. That is an adult activity. Children think and they act. In this book, our young characters do not always talk like children, in order to hammer home the intended lesson. Unfortunately, this technique ends up taking away from the story. Children are used to being preached at, and they will typically reject it in their literature, especially if they are reading for enjoyment. One aspect of the writing that I did enjoy was the nod to Mark Twain’s Tom Sawyer. Rabbit, who is high spirited and adventurous does not con anyone into painting a fence, but he is able to get his younger brother, Bear Paws, to embark on all kinds of things that he would not normally do. Rabbit is clever, like Tom Sawyer, in the way he convinces his young brother to buck the rules and go along. Bear Paws is a good boy who does what he is supposed to, except when his brother is around. Unlike sections of the writing, the art is not cluttered. The color palette is light and bright. The shading is done eloquently with color and the inking is left to a minimum. The sequential art is easy to follow and makes sense from panel to panel. Solomon uses several panels per page, which works well with the oversized format. He averages 12 panels per page but had up to 15 on some pages. Sometimes the size of the font is small in order to fit in all of the dialogue. This typically only happens when a character is preaching to the reader and could be eliminated by reworking the story. Solomon does include a nice map at the beginning to help the reader make sense of the location of the Ojibwa nation and America in the 18th Century. The map at the beginning of the book. This is an appropriate book to use when studying Native American peoples and cultures, especially those cultures that are different than those living in the plains regions. The oral traditions are strong and would be a perfect fit for study in the classroom. Students could write about the Ojibwa story that describes how the world was flooded because of corruption and how the world came into being again. Specifically, they could compare and contrast that story with others they know or have heard of. If a teacher stops the students right after the oral stories, then the students could also write about what the story means, before the characters tell them. This would allow the students to re-read the Ojibwa mythos and make sense of it on their own. 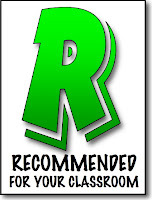 The comic is also produced online, which is the good compliment for any technology-based classroom. The creators and publishers should be proud of the fact that they publish an online version. According to the website, there is a strip posted every Monday, which could make for an on-going Communication Arts or Social Studies assignment. Comicsintheclassroom.net has also published two different lesson plans around this work. Click here and here for them. There is an online comic and there are other graphic novels in the works. Despite the writing issues, the work is still advantageous for the classroom. Students need to be exposed to different cultures and sub-cultures. This is an appropriate book for any classroom or library. The art is great and the pages are easy to follow. I do hope that the writers work harder to show us, rather than telling us.